I am just looking at gun handling, mobility and armor. Gun handling the obj 277 is slightly better with 265 reg pen, 1 sec faster reload time, .18s faster aim time but the dispersion on turret traverse is .2 worse over the IS7 making snap shots harder without aiming also the gun dispersion is .36 on the obj 277 and .38 on the IS7. Mobility the IS7 is slightly better with 59kmh over 55kmh, .36 better spesific power, and all other values they seemed to copy from the IS7 to the 277 other than the one area the 277 is better which is traverse speed which is faster by 4.1 degrees a second. Finally Armor IS7 takes this hands down with 10 more mm of frontal armor and better sloped armor too according to tanksgg fracing head on you can pen both the lower and upper plates of the obj 277 with at least 230 mm of pen where the IS7 upper plates require 290-310 mm pen and the lower plate 230 mm pen and side scraping the IS7 weakest plate is 260mm where [edited]the obj 277 is 180 at best making it a target for tier 8s. This is just what I can find and i really see the obj 277 better is if you are a noob and load gold thus giving you 340 mm pen over the IS7 which only has 303 mm pen for gold rounds and if WG goes ahead with prem round nurf will that make the OBJ 277 obsolete? Edited by REDENG, Jan 24 2019 - 18:21. I also like the is-7 better. Plus the is-7 uses apcr, to where the 277 uses heat. But I'm just a baddie, so what do I know. The is7 has a pike nose making aroumer horrible at certain angles. The mobility of the 277 is hands down better, its faster than some tier 10 mediums. and the gun isnt craplike the gun on the is7. theres a reason why clans are looking for people in 277's, because its meta. I don't think so... it's a tank plan and simple..
Metagaming is any strategy, action or method used in a game which transcends a prescribed ruleset, uses external factors to affect the game, or goes beyond the supposed limits or environment set by the game. ... In simple terms, it is the use of out-of-game information or resources to affect one's in-game decisions. As far as "noobs using gold rounds", GET OVER IT. War is not fair, and wars have been won and lost based on economics and who could afford the better weapons forever. Thats just how it is. If you can't afford the weapons the other guy has, thats your own fault. Stop buying up every tank in the game and save some of that money to fire some better shells when you need to. If the other guy is firing gold rounds, well, apparently he can afford it. It might cost him economically in the long run, but theres nothing "noob" about that. He might just have a more "win at any cost" mentality than you do. I carry gold rounds on every single tank, and I'm not afraid to use them, because I know the other guy will probably use them on me, but I won't cry about it and call him a noob if he does. If he uses a gold round on me, I'll try to return the favor with 4 or 5 of my own. is-7 is far from obsolete but yes, the 277 is currently very popular with the lads. Dude were you not paying attention? I think from what everyone has said makes me realize the Obj 277 is meta because its kinda like the IS7 but better Prem pen making games easier to get damage. so it will be interesting to see what happens to the tank after WG plays with prem rounds. Wat?, what would the is-7 become? I would argue the 277 is for more skilled players. 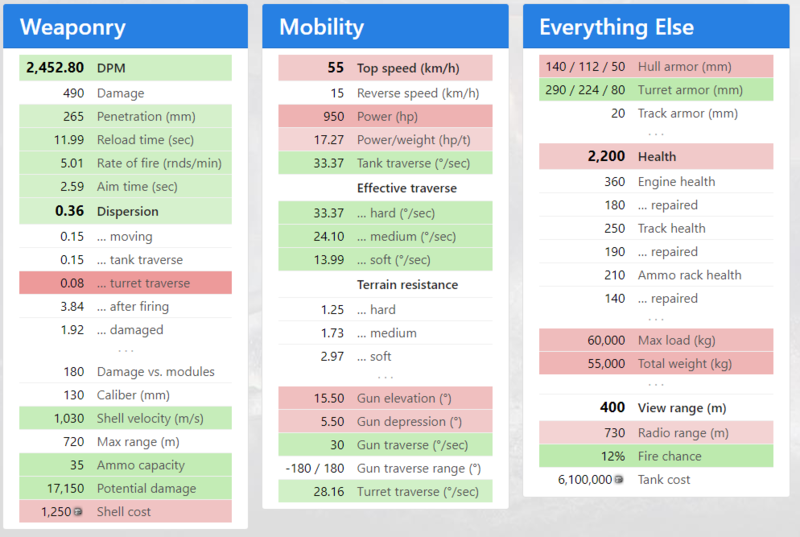 The is-7 has less pen (250 pen), slower aimtime (2.78) , less accuracy (0.38), worse gun handling while moving and turning the turret, better hull armor (but then most just hit your lp and pen), better p/w (but hidden stats make it worse), better top speed (59.6) (you really only reach it down hills), worse terrain resistances) no turret weak spot (unless you face hug tall tanks) (250 front turret armor) worse dpm (2237), higher chance to catch fire (15%). The obj 277 has More pen (265, +15 over is-7), faster aimtime (2.59), better accuracy (0.36), better gun handling on the move and while turning the turret, worse armor with a turret weak spot (its tiny though, and I have used it to bait shots. ), better base turret armor (290 in front), worse top speed (55), but it can reach it on flat ground, better dpm (2452), lower chance to catch fire (12% chance)." I only use ap, unless I have to use prem. Edited by lAimBotl, Jan 24 2019 - 23:31.
according to this what am i missing? Also on paper 277 is slower with worse hp/t and the same terrain resistance, but it reaches 55 on flat ground and the is-7 doesn't. So pretty much is-7 just has better hp and kinda armor. I got around 5 crew skilz in my 277 .